WELLINGTON, New Zealand (AP) — Fiji's post-Olympic slump after winning gold at the Rio de Janeiro Games continued Sunday when it was beaten 26-5 by South Africa in the final of the New Zealand Sevens. 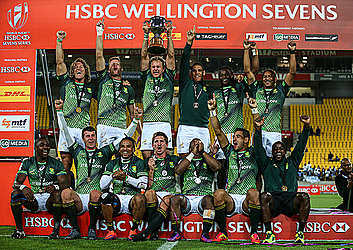 With its first win in Wellington since 2002, South Africa firmly established itself as the No. 1 team in world sevens this season. South Africa has now won two of the first three legs of this season's World Series, beating Fiji to win the opening round in Dubai, then losing to England in the final of its home tournament in Cape Town. It beat Fiji twice in Wellington, winning their first meeting in a difficult pool 31-12 on Saturday, then demonstrating its superiority with four tries to win Sunday's final. South Africa was unbeaten over the course of the weekend in Wellington and conceded only three tries in six games. "We are happy to get a first win (in Wellington) since 2002 and it's extra sweet after last year's defeat in the final," South Africa captain Phillip Snyman said. "Playing Fiji twice in one weekend doesn't make it easier but our defense system was great. "Hats off to the guys and the coaching staff. It wasn't zero tries (conceded) so definitely there is some work to be done before (the next round in) Sydney." Fiji scored the first try of the final through Joeli Lutumailangi, but South Africa then established its control as Ruhan Nel and Rosko Specman came off the bench to make major contributions. Nel scored two tries and Specman scored another while the 2016 Sevens Player of the Year Seabelo Senatla scored South Africa's first try and had a hand in Specman's just after halftime. To win in Wellington, South Africa had to come through a pool which included Fiji and Rio de Janiero quarterfinalists Australia. It then beat France 45-0 in Sunday's quarterfinals and Canada 21-5 in the semfinals before its final win over Fiji. After losing to South Africa in pool play, Fiji recovered to emphatically beat hosts New Zealand 26-10 in the quarterfinals and Scotland 19-12 in the semifinals. Scotland was one of the surprises of the weekend, emerging in second place from its pool to beat rivals England 14-12 in a thrilling quarterfinal.